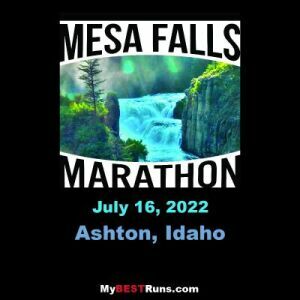 123 days, 16 hours until 2019 Mesa Falls Marathon. Congratulations to Mesa Falls Marathon runner Suzy Seeley for setting a Guinness record! Kelly Richey Photography is photographing the 2018 Mesa Falls Marathon. Purchase your marathon photos HERE! Mesa Falls finishers: Review to win! Enjoy your scenic running tour of beautiful Eastern Idaho? Now tell other envious runners about your Mesa Falls experience, and you could run next year for FREE! Simply post your review for any Mesa Falls Marathon event on RaceRaves.com by Sunday, September 9, 2018, and you’ll automatically qualify to win a free entry to next year’s event. Read more about Mesa Falls finishers: Review to win! The Mesa Falls Marathon will continue the tradition of giving started by the former Grand Teton Relay. We ask that every runner consider donating a few cans of food to the Ashton Food Bank. Donations can be provided at packet pickup prior to the marathon. The Ashton Food Bank thanks you! "I just want to drop you a line and let you know how much I'm looking forward to this race. I am a stage four cancer patient. I have been able to run two marathons since my diagnosis four years ago by working them in between treatment rounds. Read more about The Comeback! Runnersgoal.com has featured the Mesa Falls Marathon in their Runner's Choice Awards based on the excellent reviews from participants. Guess who’s coming to our 20th Anniversary Marathon? Ryan and Sara Hall! We are thrilled to host America’s Fastest Husband and Wife Team. In talking with the Hall’s they are as excited to visit Ashton as we are to have them come! What an amazing way to celebrate 20 years. Read more about Guess who’s coming to our 20th Anniversary Marathon?